Herniated or slipped discs occur when the jelly-like center of the disc breaks through the slightly tougher outer layer, creating a bulge. Some herniated discs cause few if any symptoms, but others can cause moderate to severe back and leg pain. Slipped discs cause symptoms when they press on nerve roots and soft tissues. The discs are not painful as they do not contain any nerves inside them. Herniated discs in the lower back cause lower back and leg pain as well as pain in the buttocks. If the nerve roots are severely compressed or pinched, the individual may also notice numbness and tingling in their legs. If the herniated disc is in the upper back, it can cause shoulder and arm pain as well as numbness and tingling in the arms. Some people also experience muscle weakness, which impairs their mobility. While most herniated discs are simply caused by the normal aging process, certain risk factors, like being overweight, having a physical job and your family history, can increase your likelihood of developing a herniated disc. Some individuals may experience severe symptoms that may require immediate medical attention. If your back pain suddenly gets worse or you experience loss of control of your bladder or bowels, you should immediately seek medical attention. These are symptoms of a severe nerve compression that could cause permanent disability if left untreated. Chiropractic care is a non-invasive treatment approach to healing herniated discs. Our chiropractor in Dallas, TX will perform an examination and take a medical history to determine the severity of your herniated discs and any additional injuries, like muscle pulls, that might be exasperating your pain. We may also recommend x-rays or digital images so that our chiropractor can see the exact location of your herniated discs and its severity. Once a complete diagnosis has been made, a treatment program will be developed to reduce your pain, restore your mobility and heal your disc. Chiropractic adjustments are an effective treatment option for herniated discs. 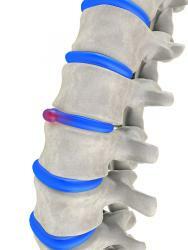 Misaligned vertebrae can exasperate your pain by causing inflammation and irritating surrounding nerves. By correcting your spinal misalignments, we are helping to reduce your soft tissue inflammation, which lowers your back pain. As treatments progress, your disc herniation will slowly start to retract, which permanently reduces your pain and restores your mobility. In addition to chiropractic care, we may also recommend certain exercises and stretches as well as nutrition advice. Light exercise and stretching can help increase your muscle strength and flexibility, and improving the nutritional value of your diet will help your body better heal itself. Contact us to schedule an appointment for your lower back pain with our chiropractor in Dallas, TX, call our office at 972-392-9402.